I was pretty psyched to see a little Future-ish action play out on Project Runway Season 12, "Finale, Part 1". Two designers stood out to me. Dom Streater, was inspired by Blade Runner and described her garments as "retro-futurist" explaining that the aesthetic centers on angular lines meeting curved lines. These elements were then translated into the prints that she designed for the collection. I've seen a few of her runway show designs online already so can't wait to see the full collection. Justin LeBlanc also really amazed me. He's been one of my favorite designers all along but his incorporation of 3D printing into his final collection really wowed me. 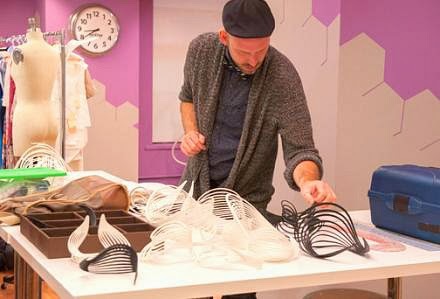 3D has been around in fashion for quite some time now but for a contestant on Project Runway to incorporate it into a full collection, shows that the technology is becoming much more accessible. CAN'T WAIT for the finale!! !